Continuous arterial blood gas monitoring systems? Determination of arterial oxygenation, arterial CO2 partial pressure and pH is traditionally performed by intermittent arterial blood sampling. However, this method presents a number of disadvantages such as the need for iterative and uncomfortable arterial punctures, and can be associated with substantial blood loss [1,2]. Despite these major impediments to serial measurements, arterial blood gas values are the most frequently ordered laboratory examinations in the intensive care unit (ICU) and the operating room . In the ICU, except for once-daily analysis which represents a `spot check' of the physiological state of the patient, indications for sampling are essentially the result of a deleterious event . In these situations, sampling depends greatly upon the judgement of the physician, nurse or other health care provider to determine whether a blood gas measurement is needed. The delay between the event itself and blood sampling, plus the delay in obtaining the results, means that this sort of analysis may be misleading. For example, clinically important changes in a patient's blood gas status may go undetected or may occur after a sample has been drawn and while it is being analysed . Moreover, considerable spontaneous variation in blood gases frequently occurs, even in stable ICU patients . Because clinical decisions need to be made on the basis of trends in blood gases as well as with the rapid detection of an acute event [6,7], continuous non-invasive monitoring techniques, such as pulse-oximetry and continuous capnography, have been developed. Unfortunately, these devices are not always accurate or reliable in acute situations such as shock, hypothermia, or during the use of vasopressors [8,9]. Moreover, pulse-oximetry does not measure oxygen tension, and major drawbacks also exist for continuous capnography. Since the 1980's several attempts has been made to develop equipment which is able to overcome the disadvantages of intermittent arterial blood sampling and those of non-invasive monitoring. The goal of the research has been to develop a real-time continuous blood gas monitoring system. This led to the development of `blood gas monitors' which were defined as `patient-dedicated apparatus used to measure arterial pH, PaCO2 and PaO2 without permanently removing blood samples' [10,11]. Two different techniques of blood gas measurement, based on electro-chemical or optical principles, were initially proposed . However, blood gas electrodes were not readily adaptable for this type of monitoring because they required frequent replenishment of reagents and recalibration. Later, new technology was developed that monitored blood gas levels using optical sensors (optodes). A uv light source is pulsed, at a predetermined frequency, at specific dyes in the blood stream which are sensitive to one or other analyte. The light is re-emitted at a lower intensity and the decrease in fluorescence is proportional to the concentration of analyte in the dye [13,14]. The monitor provides the computer support needed to calculate the blood gas values using the signal from the sensing element. Two different apparatus, which differ in the location of the sensing element, were developed: extra-arterial blood gas (EABG) monitors and intra-arterial blood gas (IABG) monitors. The EABG system utilizes optodes which are externally attached to the arterial catheter (CDI 2000 Blood Gas Monitoring System: CDI-3M Healthcare, Tustin, CA), in an attempt to avoid the patient interface problems observed with the first IABG devices [15,16]. This on demand catheter allows direct blood gas analysis at the bedside [5,6,7,8,15] and significantly reduces the delay in obtaining results. Moreover, different studies have demonstrated accuracy and precision comparable with conventional blood gas analysers, even with blood abnormalities in acutely ill patients [1,17,18,19]. This system seems to demonstrate greater precision for PaO2 analysis than continuous IABG monitors . However, the on-demand monitoring system is not continuous. Whenever a blood gas value is required, blood is drawn up into the arterial line tubing past a cassette containing optodes measuring pH, PaCO2 and PaO2. The rate of measurements taken is obviously dependent on the frequency of the decision to draw a sample . Such monitors do not obviate the problems associated with dependence on clinical judgement as to when samples should be drawn. Moreover, trends are not recorded and accurate detection of life-threatening events associated with acute changes in blood gases is not achieved. This technique does not, therefore, strictly adhere to the definition of continuous assessment of arterial blood gases . Unlike on-demand catheters, IABG monitors offer the interesting possibility of ensuring real-time continuous measurement of arterial blood gases . Based on the same optode technology as the EABG devices, this technique differs because the sensor is directly inserted into the arterial blood stream. Unfortunately, until recently none of these devices had demonstrated adequate clinical performance, [15,16,23,24,25,26]. Their consistency and reliability were unacceptable because of significant malfunctions and inconsistencies that were shown to be attributable to the intra-arterial environment . Aberrant blood gas values, obtained particularly in cases of hypotension or vascular construction were attributed to the `wall-stress effect' on the sensing element [15,16]. Since the first attempts, however, several companies have further developed optode-based IABG monitors: the PB 3300 IABG Monitor (Puritan-Bennett Corporation, Los Angeles, CA), the Paratrend 7 Intravascular Blood Gas Monitoring System (Biomedical Sensors Ltd, Malvern, PA), and the Optex BioSentry Optode System (Optex Bio-medical Inc, The Woodlands, TX). These continuous monitoring systems consist of a sterile, disposable, fiber optic sensor introduced through a 20 gauge arterial catheter, and a microprocessor-controlled monitor with a self-contained calibration unit and detachable display and control panel. The sensor contains small optical fibers (one fiber for each analyte) which are bundled together in a biocompatible package. Each fiber is about he diameter of a human hair. Even bundled, the entire sensor is small enough to be inserted through a 20 gauge catheter (1 mm). After in vitro calibration in a sterile cuvette filled with a buffer solution, the sensor is inserted via an arterial catheter into the patient's arterial blood stream. No further calibration is needed. A Y-port built into the sensor permits continuous blood pressure monitoring and allows blood withdrawal. The sensing element is at the tip of the optic fibers. An optical signal is processed by the monitor and displayed as the patient's values every 20 s, without external intervention, and the display screen provides current numerical values and real-time trends for each parameter, allowing continuous monitoring. 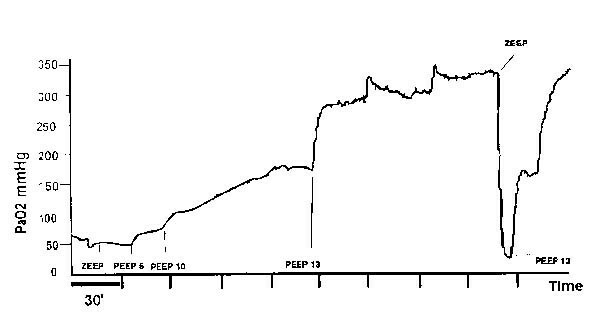 An example of a real-time trend of PaO2 during a PEEP trial is shown in Fig 1. The main advantage of continuous monitoring is having reliable values of blood gases available on-line, especially in life-threatening situations. Moreover, IABG monitors could potentially benefit respiratory care in the ICU, particularly in patients with unstable respiratory status, and might replace standard systems of blood gas sampling. However, it has to be demonstrated that the equipment is accurate, precise and reliable for wide ranging and unstable blood gas levels, characteristic of acutely ill patients entering an ICU. Larson et al  have evaluated one of these new continuous IABG monitoring systems (PB 3300, Puritan-Bennett Corporation, Los Angeles, CA) in patients undergoing surgical procedures and postoperative intensive care. The accuracy of this particular continuous IABG monitor was found to be acceptable when compared to conventional arterial blood samples for values observed during and after uncomplicated operative procedures. Arterial blood gas and pH values, however, were for the most part within normal physiological ranges. Two further studies [28,29] in the ICU have confirmed these results. Haller et al  evaluated the performance of this device in critically ill patients with respiratory failure. They also found a high precision for PaO2, PaCO2 and pH. However, only a small fraction of their 487 pairs of data were in the range of extremely abnormal blood gas values. The same results were demonstrated, in similar conditions, with the Paratrend 7 Intravascular Blood Gas Monitoring System [30,31]. However, in their report, Venkatesh et al  withdrew one patient (Pt 8) from their analysis because he demonstrated a large bias and a considerably higher precision than the rest of the patients (n = 13), especially in the PaO2 comparison. All of these studies, however, concluded that an acceptable level of clinical accuracy was found, even for PaO2 and demonstrated an improvement in the performance of the new IABG monitors when compared with previously published data [27,28,29,31]. In fact, Venkatesh et al enthusiastically claimed that the sensor will become `an important tool in the management of critically ill patient . However, this very optimistic view is not complete' justified. In a recent study, we reasoned that the clinical performance of continuous IABG monitors should be tested in extreme situations such as `abnormal' ranges of PaO2, PaCO2 and pH, and during episodes of hemodynamic instability where non-invasive monitoring failed. These tests were done to discover whether these devices were able to provide accurate information in critically ill patients . Our results indicated that, compared to classical electrochemical measurement of arterial blood samples, continuous IABG monitoring essentially provided reliable and clinically accurate blood gas results for pH and PaCO2 even with highly abnormal values (PaCO2 > 90 mmHg, pH < 7.1). Furthermore, when looking at sequential changes, continuous IABG monitoring and arterial blood sampling were very similar indicating that continuous IABG is able to follow variations in blood gases successfully over time. This new continuous monitoring system was also reliable and accurate during episodes of low blood pressure even when pulse-oximetry failed. However, although we found the same good results for PaCO2 and pH, our findings differed for PaO2. Whatever the test conditions, the differences between the electrochemical and fluorescent optode (IABG) technologies appeared greater, and unacceptable, for PaO2. Differences as high as 30 mmHg were found . Although there are inherent errors in both methods of measurement, pre-analytic and analytic errors in conventional blood gas analysis prevent this method from being regarded as `the gold standard' to which IABG monitoring is compared . However, the fact remains that the large interindividual difference in the performance of continuous IABG catheters observed for PaO2 suggests that at least the PaO2 analyzer was not accurate enough . Apart from the discrepancy for PaO2, the other important problem observed was the brittleness of the fibers. Six of the 21 fibers were broken as soon as they were inserted. A simple flexion of the hand was enough to break the device . As shown by our experience, the sensor is fragile and easily damaged during insertion, particularly the oxygen component which is at the tip of the sensor. To be clinically useful the sensor must be rugged or sheathed in a way that would prevent its damage at insertion . In addition to the improvement in the accuracy of PaO2 measurements, this is an important consideration for the future development of such equipment. Since our own evaluation of the PB 3300, this device has been withdrawn for economic reasons. At present, the only manufacturer of continuous IABG monitoring equipment is Pfizer Biomedical Sensors, with their Paratrend 7. This device has achieved the same results as the PB 3300, but is also affected by the same limitations that we have noted for the PB 3300 [31,33]. On-line evaluation of PaO2 during a PEEP trial. ZEEP is zero PEEP. Does this technology really improve patient care? What is the cost-benefit ratio of such an expensive device? Although some authors have suggested that the development of such systems would have important implications for critical care practice and cost efficiency [34,35], no trial has yet focused on these fundamental questions. Until such studies are completed and evaluated, it is reasonable to agree with Dr C Larson, that `continuous arterial blood gas monitoring is a technology in transition whose fate is yet unknown'.